Earlier this year I had the distinct pleasure of hosting yet another one of Axhoundation’s intensely well-curated interdisciplinary seminars. This year’s theme Sanning och Konsekvens – which in Swedish means both “Truth and Consequence” and “Truth or Dare” – covered topics ranging from Fake News to No-Till Farming. UR televised the whole thing, which you can see on Kunskapskanalen today 15-18, on Sunday Dec 10th at 9-12, and thereafter on UR Play. Among the speakers: Paul Rapacioli of TheLocal, Jeppe Wikström of Last Night in Sweden, Maureen Hoppers from ÖppnaDörren, Jan Helin from SVT, Åsa Wikforss and Gustav Nilsonne from Stockholm University, Maria Wolrath Söderberg from Södertörns Högskola, Ola Rosling from Gapminder, Alexandra Silfverstolpe Tolstoy from Data Act Lab, Morten Kjærum from Raoul Wallenberg Institute, Ebba Åkerman and Lina Makso from Invitationsdepartementet, Jabou Foon from Sisters in business, David R. Montgomery from University of Washington, Anna Westerbergh from SLU, William Håkansson from Vultus, the marvelous Angela Oguntala of Greyspace and yours truly (although I as the moderator have probably been mostly edited out). Hundreds of people showed up at Kulturhuset in Stockholm on a Thursday afternoon to hear a conversation between the distinguished Carl Folke (of the Stockholm Resilience Center, the Beijer Institute of Ecological Economics, etc) and myself; towards the end we were also joined by music professor Anna Lindal. Our topic was the Overview Effect, the well-documented phenomenon where a – literally – new perspective gives astronauts a cognitive shift involving great clarity about the fragility of the Earth. Since we clearly cannot put everyone in space to experience this shift, we have to find other ways to give humans the Overview, and that was the topic under discussion. The conversation was followed by a concert with the amazing Fire! Orchestra, who performed new music to video projections on the Earth from space. This was all a pretty mind-blowing experience. We were also scheduled to converse on a live link with an astronaut at the ISS, but his day changed and it was cancelled late. Of course I was rather disappointed – but the whole session turned out to be so powerful that I think, in the end, it was no great disaster. The event was a part of The Stockholm Act, in collaboration with the Swedish National Space Board, Rymdstyrelsen. On Wednesday evening I had the pleasure of discussing Dmitry Gluchovsky’s writing and especially his new novel Futu.re with the author himself at the Kulturhuset culture house in Stockholm. It turned out to be a really interesting conversation about ideas of East and West, lies and truth. If Metro 2033 was about Russia at the end of the cold war, the third novel in that series, Metro 2035 – out in English this week – is about Russia today, and Futu.re is about Europe today. (Since the Russian original is actually four years old, you could even argue that it’s eerily prescient on some issues). In Futu.re, Gluchovsky does that thing again he does so well, creating a high concept scifi page-turner engaging with enormous ideas around immortality, parenthood, society and the meaning of life. You should read it. And I’m thinking, if you’re from the so-called West, perhaps you should read it with Metro 3035, because it is actually super helpful at a moment of political upheaval to have the viewpoint of someone friendly from outside of your own context who has very few illusions about political honesty. The conversation was recorded and I think the Kulturhuset International Writers’ Stage will publish it in their pod series eventually; I’ll try to link to it when they do. Fun news! The workshop version of my play The Chicken Trial, originally produced by Viirus in december at the Text festival, is going to Edinburgh! It’ll be performed in English by local actors, but the director is the same – the most excellent Fredrik Lundqvist. An extra fun thing is that The Times picked the play for a list of reasons to go! They’re working from the blurb, as far as I know, but I’m still very happy! This is very Sweden specific: for the last few months, I’ve listened religiously to the masterful podcast Lundellbunkern, by my ingenious colleague Tommie Jönsson with Johannes Klenell and Maja Åström. And, in today’s episode, me! I speak AT GREAT LENGTH about Ulf Lundell, pop culture criticism, Carola Häggkvist, and loneliness. Find it here. Also, if you’re in Stockholm, you should go to Södra Teatern tomorrow, Wednesday March 2nd, for the taping of the final episode. Annika Lantz will be hosting. Find it here – it’s free! The 2016 Nostradamus report on the near future of the film and TV industries was released last week at the Nordic Film Market of the Göteborg International Film Festival. Read more about the Nostradamus Project here. The report was covered in Variety and Screen Daily. I visited Roger Wilson in P1 Kultur to talk about the future of TV and film (in Swedish). The full 55 minutes is worth a listen – find it here! (Swedish). 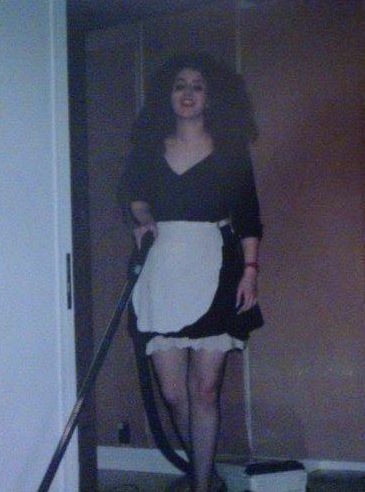 Below is a pic of me in around 1997 just before visiting either the touring Rocky Horror Show or a RHPS screening in Helsinki. (Picture probably taken by Jaakko Stenros).